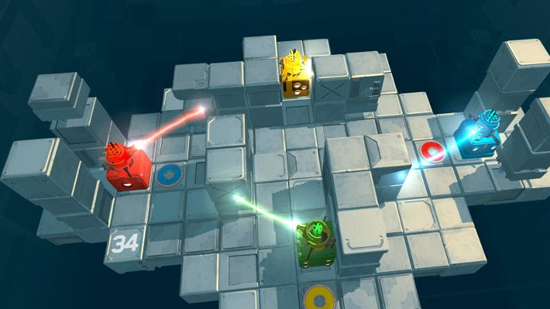 Danger lurks around every corner in Death Squared's series of intricate puzzles. Teams of two or four simultaneously and individually guide robots to their respective color-coded waypoints, and all must reach the end for the group to achieve victory. At its core, Death Squared is about communication and experimentation. One false move can trigger hidden hazards and the fun is learning each stage's "rules" through trial, error and cooperation. Instantaneous respawns help players put newly-gained knowledge about a level's pitfalls to quick use. With an emphasis on teamwork, Death Squared is best enjoyed as a multiplayer experience. Solo players and parties of two can play through the story mode, while more chaotic stages await groups of four with specially-designed "party chaos" challenges unseen in the main campaign.